Golf is a game that really differs from person to person. We’re always looking for new ways to lower our handicaps, to make our games easier, and to add a bit more character to our strokes! There are tons of great golf gadgets out there. Some of them are useful; others are downright daft! In this guide, we’ve rounded up the 15 best golf gadgets available for you to buy in 2019 and beyond. Whether you need a helping hand in improving your putts or need a digital caddy by your side, here are some fantastic ideas to help you get started! Good at getting the ball up in the air, but foxed when it comes to getting it in the hole at the end of the green? You’re not alone. That’s why the fantastic PuttOut trainer was created. This innovatively-designed putting aid teaches you what makes a great putt, and when you need practice. It folds up nicely and fits into your golf bag. Yes – believe it or not, it makes sense to have a clean ball before you strike it. Mud and water can impact on the accuracy of a stroke. This 3-pack of microfibres cloths clips easily to most bags. It’s also nice and compact, meaning it’s never cumbersome to carry around with you. 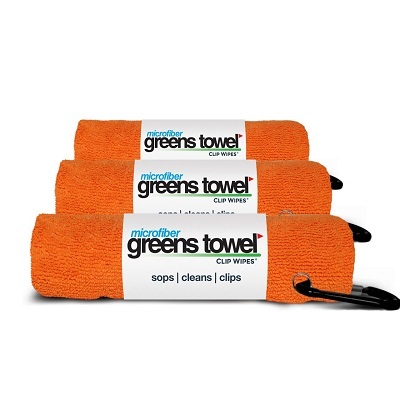 This superb towel can be used to clean balls, clubs and more on the course. 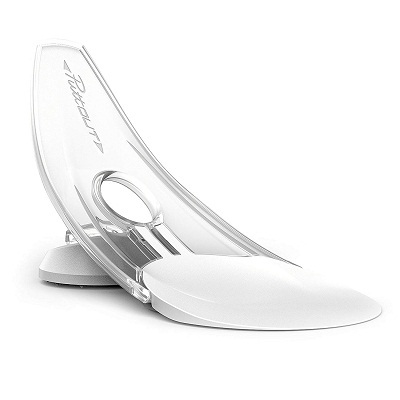 Of all the golf gadgets on this list, this one is perhaps best reserved for adult use only! 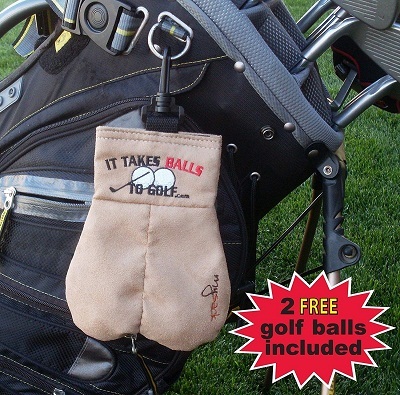 This sturdy, leather pouch is a hilarious gift for any golfer who doesn’t take himself too seriously. Shaped like a particular part of the male anatomy, the MySack bag has plenty of physical benefit beyond its jokey look. 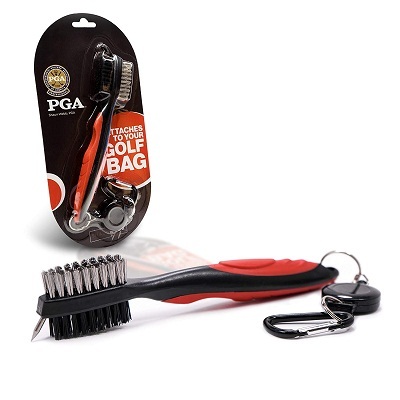 It clips easily onto most golf bags and benefits from double-stitching and Velcro for heavy-duty use. Some of the best golf gadgets you can buy will help you navigate those tricky holes with ease. 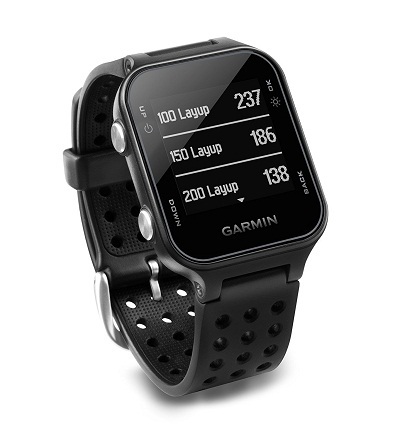 This GPS watch not only gives you access to maps but also tracks your activity. Everything you do on a round gets analyzed. That means you get to really hone your consistency on the swing. It’s a great way to keep track of how your game is improving, as well as to see what’s up ahead. Of all the golf gadgets we’ve reviewed, we think rangefinders are some of the most essential. 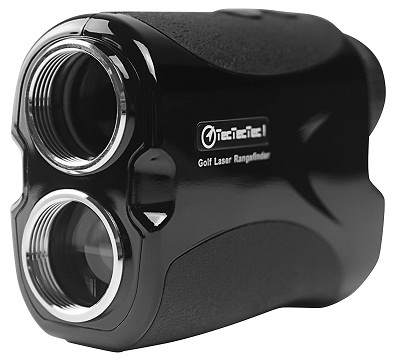 This laser rangefinder can help you survey the course ahead of you. You’ll get access to accurate distance data and information on how to make the best shots. For many people, a rangefinder is an asset in helping to understand new holes. This particular model is smart, sleek and offers incredible course accuracy – you can depend on it from shot to shot. 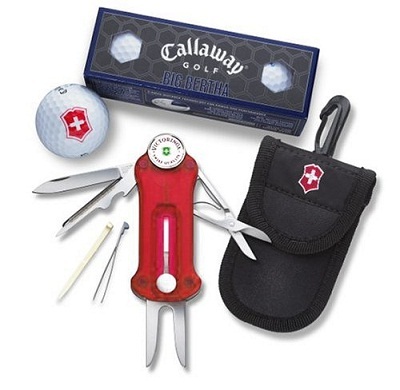 Yes, believe it or not, there’s now a Swiss Army knife built just for golfers. This multi-tool has ten separate tools which pop up with ease. The model even sells with Callaway brand golf balls online – a great package deal. The army knife boasts repair tools, scissors, pocket blade, tee puncher and ball marker tools among several others. It’s a comfortable fit, and everything you should need on the course can be popped out at a second’s notice. Marketed as being ‘almost unbreakable,’ these are strong, sturdy tees are for use across all courses in all weathers. Of all golf gadgets, 2019 players will be looking for; we can bet tees are high on the shopping list. These tees come with a handy measuring guide on each model. 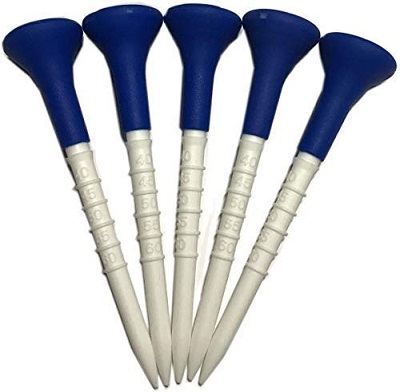 They’re also made of high-quality rubber to help protect your golf balls during each shot. These are super-protective, hard-wearing tees which are well worth the price tag. When people think of golf gadgets, this may well be what comes to mind first of all. This executive putting set makes a fantastic gift for any budding putter or seasoned linksman or woman. Putting in the office is now entirely possible! 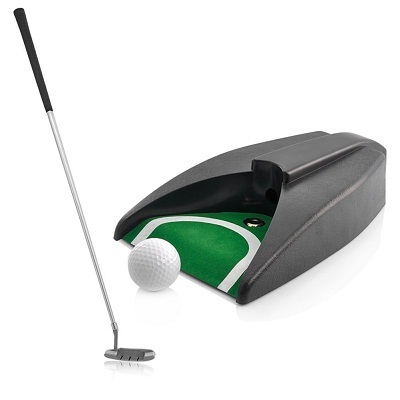 This all-in-one golf set comes with a putter, a hole, a ball and carry case. While it may seem simple, or even gimmicky, it’s a great way to keep you on your putting game while off the course. Regardless of whether or not you know who Shaun Webb is, this brush set is a brilliant asset to any golfer’s game. This lightweight kit designed by the PGA star comes with a retractable zipline for ease of access when clipped to your bag. It’s important to keep your clubs tidy and clean from shot to shot.Clean up your grooves from hole to hole and maintain that perfect accuracy. You don’t always have to buy new clubs if you feel they’re going blunt. 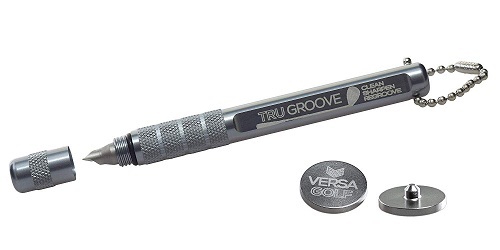 This groove sharpener will help you breathe new life into your existing swings with just a few touches. Need to sharpen up old clubs? This pen-sized gadget is easy to transport and can be used to help sharpen any irons in your bag. It’s great for helping even some of the most well-worn of clubs get back to their stroking best. There are plenty of golf gadgets 2019 will be known for, and this selfie clip will likely be one of them. No – it’s not an aid to help you get the best selfies. It’s a clip which attaches to your golf bag. You can’t always depend on what your caddy says in terms of improving your swing! 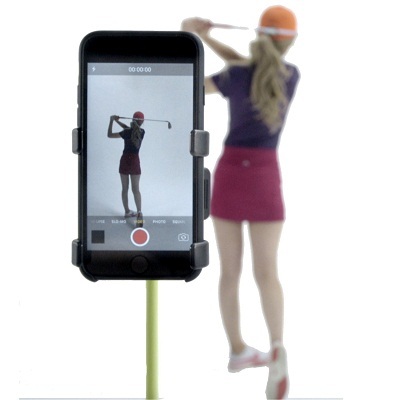 With the SelfieGolf attachment, you can record your strokes and watch them back to see how you can improve. When the sun goes down, it’s time to head back home with your equipment. But have you got it all stored carefully and concisely? Not many of us have! That’s where the brilliant Suncast rack comes in handy. Able to hold two golf bags, store accessories and clothing alike, this is likely to be an all-in-one asset for many golfers. Easily store and retrieve your golfing essentials from round to round by keeping everything in one place. If you need more of a helping hand with storing gadgets on the go, this trunk organizer will be something you need to consider. 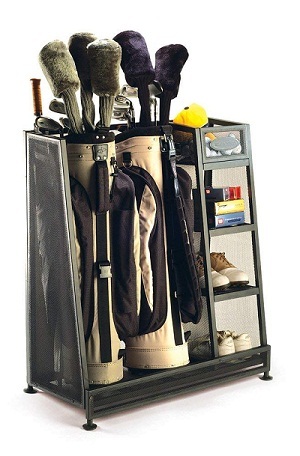 Keep all of your golf essentials and gear nicely stored and organized on the go. Whether or not you consider yourself an organized person, we could all use a little more storage while up and about. The organizer boasts dividers, pockets and packing sections to allow you to easily store even the tiniest and most awkward of golfing odds and ends. Some of the best golf gadgets around are the ones that train us as we play. This golf grip fits any club and will help you to understand how to, better hold and position your club while in the swing. The manufacturer states up to 80% of us are holding our clubs incorrectly! 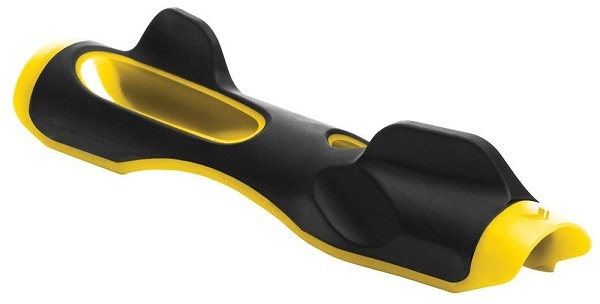 The SKLZ grip boasts muscle memory technology, which means it’ll help you build better habits. It’s a fantastic practice aid, and once you’re a little more confident, you can slip it off and try your clubs for real. Finally, a gadget which can help you keep all your modern bits and pieces in place. 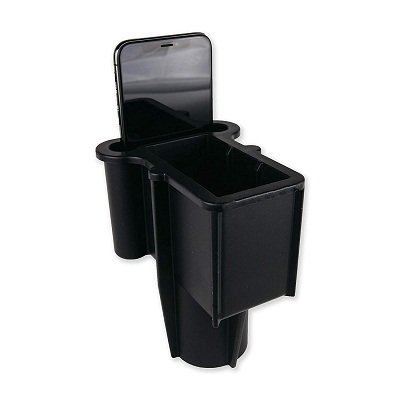 This simple holder comes in a range of colors and can fit any golf cart. Many of us have had trouble finding our smartphones and rangefinders while traveling from hole to hole! This holder helps to keep everything in one place. For anyone regularly losing important items, clip this onto your cart, and you’ll be able to keep your most precious technology in clear sight. As you can see, there are some fantastic little golf gadgets out there. We can hardly blame you for wanting to take a closer look! We love some of the hi-tech gadgets on this list – the TecTecTec rangefinder and Garmin watch will help to enhance your game in ways you’d never have imagined. It’s rare you’ll find a golfer who doesn’t have a gadget or two in their bag.Why not take a closer look at some of the brilliant tech and gadgetry available from our list? All are available now from Amazon and physical retailers across the nation.